Before getting a copy of Mickey Trescott's Autoimmune Paleo Cookbook, I did what I typically do and looked for recipes on the internet that looked appealing to me but were within the parameters of my current Autoimmune Protocol N=1 experiment. I came across this recipe for Chicken Meatloaf Muffins from Mammoth Kitchen. They appealed to me because the recipe calls for grinding your own chicken. It looks like the Mammoth Kitchen site is down as of the morning that I'm posting this. If its changed URLs I couldn't find an alternate. Regardless, the recipe was out there, I cooked it, and here it is. I gathered my ingredients. Because I'm making this AIP, I omitted the eggs which the recipe encourages. This website is based in Australia and uses the metric system in parts of the recipe. The first instruction is to heat the oven to 160 C. This converts to 320 F. The recipe also calls for 800 grams of chicken breast. This converts to just about 1 pound 12 ounces. 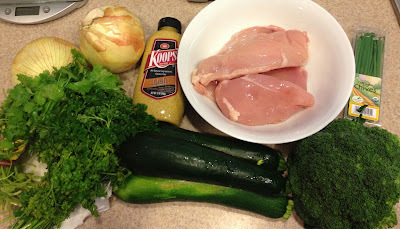 Also, I didn't use whole grain mustard because the one I had on hand was not AIP compliant. I used a deli mustard that was AIP compliant instead. 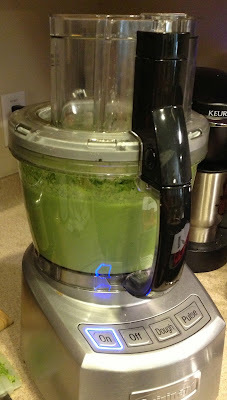 Per the recipe instructions, I started to load up my food processor with the fresh vegetables and herbs, onions, mustard, salt and pepper. 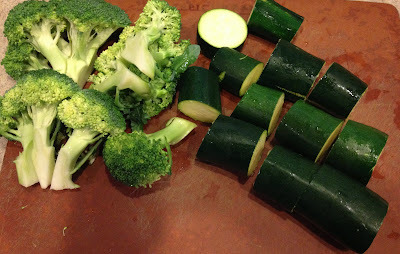 I pre-chopped them so that they would process easier. 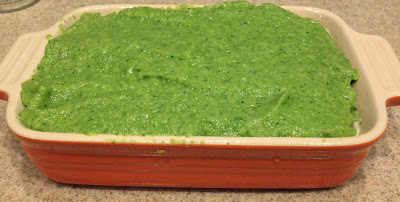 It took a few batches and a bit longer than I thought it would to get the vegetables into the consistency of "green slime." And yes, that is a direct quote from the recipe. I then added the pieces of chicken one at a time to the processor until I had a thick paste. 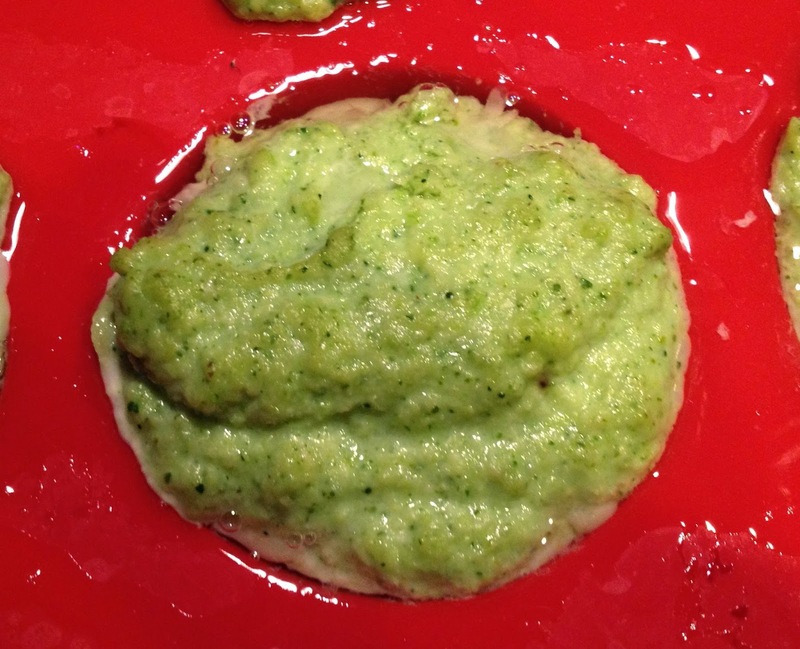 I was a bit concerned that this paste was green and gave no hint as to the fact there was nearly 2 pounds of chicken in this paste. The pictures on the website of the finished product look chicken colored. You often read about parents hiding vegetables in meat. I wondered, is this how you trick vegetarians into eating meat? Don't worry vegetarian friends, I'd never do that to you. 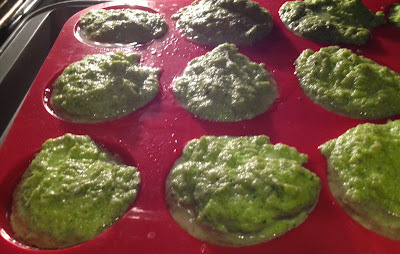 I spooned the batter into my silicone muffin pan that I had sprayed with coconut oil. I put the muffin pan on top of a sheet pan to give it stability. I had more batter than the one pan would handle so I decided to make a loaf as suggested by the recipe. Accessibility & Cost of Ingredients: You should be able to find all of the ingredients you need for this recipe at your "big box" grocery store. Preparation & Cooking Time: It took me 16 minutes to prepare this recipe to bake. I baked these muffins for 30 minutes and then added another 20 minutes just to see if they'd improve after pouring off the excess water/juice. There was a lot of water to be poured off. They were likely done at the 30 minutes. Clean Up: Make sure you have an empty dishwasher to accept all of your food processor parts and baking dishes/pans. The Paleo Review: Thumbs Down! I'm not sure what went wrong here. They looked far more green than they look in the pictures in person. They tasted very herby and the texture was not pleasing to me at all. 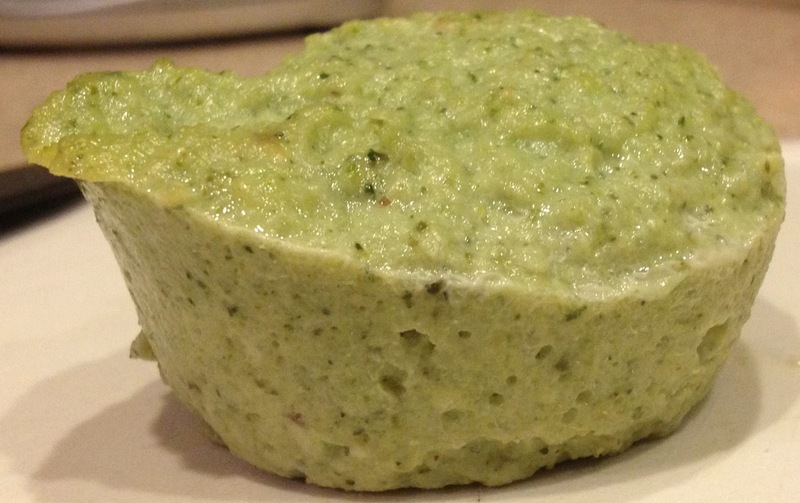 If you like a really herby muffin or loaf, you might like this, but it just wasn't for me. What might have gone wrong? Many of the ingredients don't have specific measures, such as the broccoli, zucchini, onions, parsley, coriander (cilantro) and chives. It's possible that my vegetables were bigger than hers. I tried to think of ways I could doctor these up so that I didn't have to throw them away and other than douse them in some very AIP unfriendly Tabasco sauce, I couldn't think of anything. Perhaps, if you made this recipe with the eggs things would turn out better, but it's represented as a recipe that would work without eggs and be AIP friendly recipe. It's been a while since I've really not liked a recipe and this is the only AIP recipe that I've not liked so far. Do you have a good chicken muffin recipe? 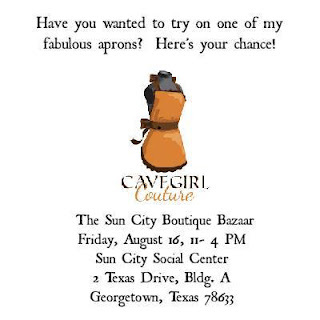 Blog Note: Shameless plug, but if you are in Central Texas and have nothing to do today, consider stopping by and trying on a Cavegirl Couture apron at the Sun City Georgetown Boutique Bazaar! 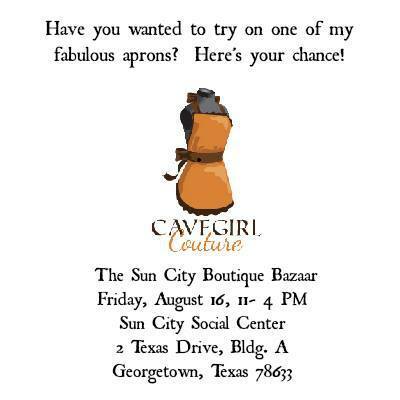 I'll be there from 10-4.